Observation of panhandlers. Some individuals turn to panhandling as a means to subsidize their income. 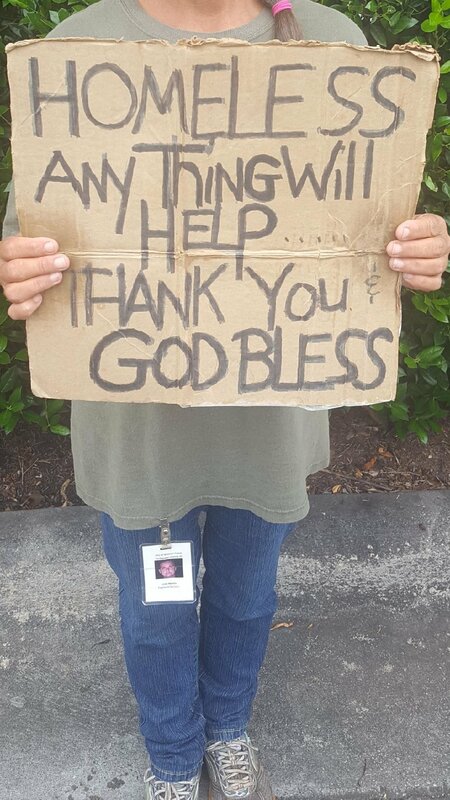 In some cities and towns panhandling has become an epidemic and problem. So, in this regard, municipalities are requiring these individuals to obtain a license to panhandle, in an effort to alleviate community concerns, and regulate and track the growing number of homeless, transients, and panhandlers. To obtain a license or permit you must have some form of identification, such as a driver’s license, passport, or state identification. In cities that require a panhandling license, the rules can be rather strict. However, the individual in the photograph license expired in 2017. This photograph was taken on 6/28/2018. When I enquired about it, she just shrugged her shoulders and replied, “Oh well”. The licenses are free by the way.